In Aliens, Bill Paxton memorably asked, “Is this gonna be a stand up fight, sir, or another bug hunt?” The latter option is especially unappetizing in light of a new YouTube video that depicts a real-life hunt for a real-life bug. As the unfortunately titled “Paranormal Cocktivity” demonstrates, a flying cockroach can be every bit as formidable and elusive a foe as Michael Myers or the Blair Witch. Like those earlier legends of horror, this insect has a talent for quick getaways; he can be there one second and gone the next. Influenced by such found footage horror movies as Paranormal Activity, the video increases the scare factor through eerie green lighting, an unsettling musical score consisting of a clanking piano over a low drone, and the queasy “shaky cam” cinematography fans have come to expect over the last decade or so. Those requisite blasts of noisy static help, too. But, when it’s briefly viewed in close up, the flying cockroach is sufficiently horrifying all on its own, with its spindly legs and soulless eyes. And, to make matters worse, the awful thing can fly. 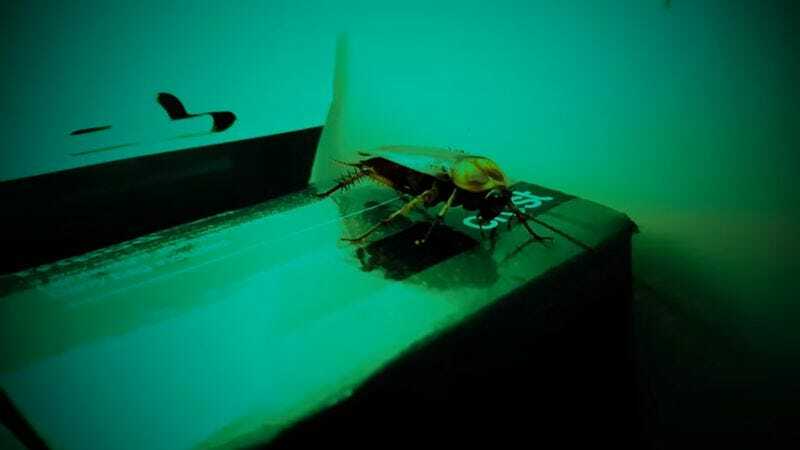 Posted to the account of one Woody Hill, the video carries a benign sounding description: “A suspenseful night at the Dutton residence trying to rid the house of a rogue flying cockroach.” That hardly prepares viewers for the wide-awake nightmare that follows. With a small flashlight seemingly providing the only illumination, a group of chortling young men pursue the terrible insect throughout the cluttered residence. They seemingly have the miniature monster cornered when it lands on a cardboard box, but then, in true horror movie tradition, everything goes dark for a moment and the creature vanishes. Those suffering from acute entomophobia are advised to proceed with extreme caution. And Raid.